Nestled within the 150 Worth plaza on Palm Beach, this Aveda flagship salon has the best ambiance of any salon I’ve set foot in recently. I felt like I was stepping into an artist’s loft in New York. 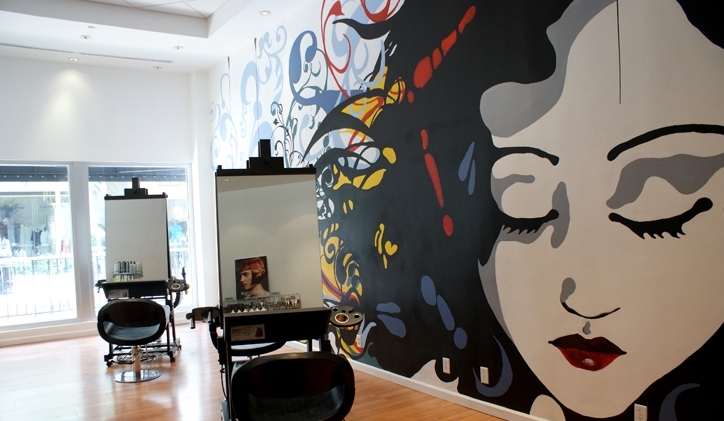 A decorative mural covers the entire wall where the easel style stylist stations are. I loved it at first look! My experience started out with a hot cup of Aveda tea, an herbal blend with hints of licorice and peppermint. So relaxing. I was then greeted by the amazing Jessica Rosmery Pamplona, Colorist owner and expert stylist who did a thorough consultation (so important) before starting my color. She took a look at my hair and noticed I have a lot of color history (guilty!) going on. At one point, my long locks had ombre, some highlights, all kinds of stuff that was showing through my faded red color. I wanted to freshen my look without changing it too drastically. I said I’d like to keep the bright red base tones but lighten and punch up the ends a little to bring back a little more of the ombre effect.she was incredibly knowledgeable, knew exactly what I was asking for and executed it perfectly. She revived my root area with a rich red and lightened pieces by section using the balayage technique before applying orange pure pigment to my ends. It is now multidimensional with red tones that melt into this funky vibrant orange. She also created a true body and soul experience by offering a relaxing Chakra Balancing session while my color processed. She shaped up my cut by adding a few layers and finished the look with voluminous bouncing curls and height at the crown. Movie star hair! 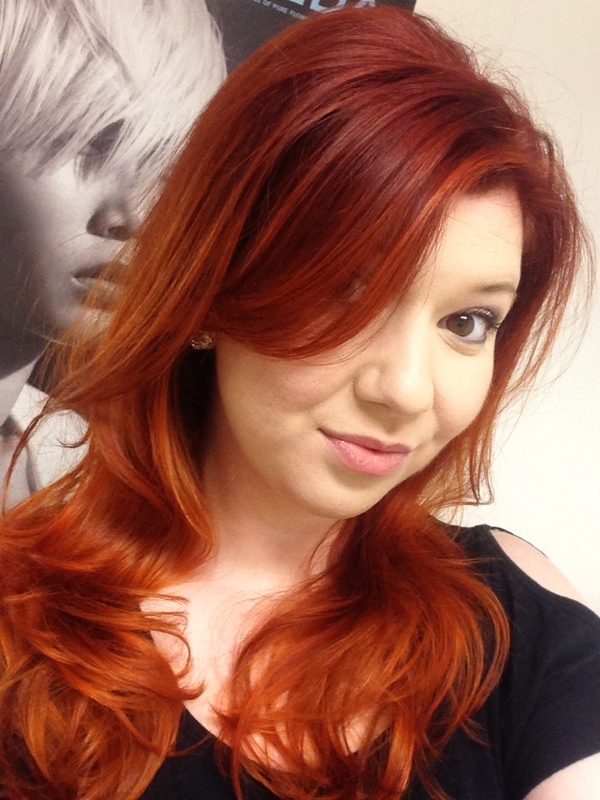 I LOVE my fiery ‘do and I would definitely recommend her services! Colorist also offers a slew of fun spa treatments like the Rosemary Mint Awakening Body Treatment and the Caribbean Therapy Pedicure. Oh, and Colorist officially has the most comfortable shampoo bowls I’ve ever set my head in. Plus ten points for that! 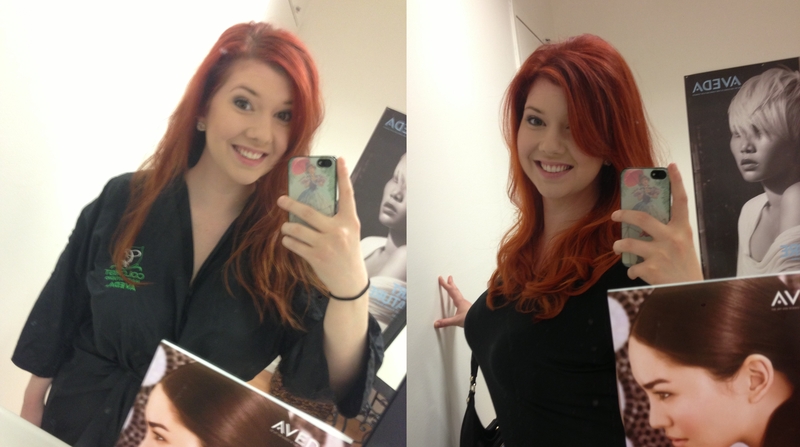 Verdict: I had a really enjoyable experience from start to finish and I love my vibrant color! Painted live during our yoga event!